Infinite Peripherals (IPC) is a leading iOS peripheral device manufacturer, providing solutions for a number of enterprise verticals including healthcare, hospitality, retail, and other commercial use cases. IPC's industrial-grade case (such as the InfineaX for iPhone) extends the function of an iOS device through features such as hot swap extended battery pack, barcode reader, RFID scanner, programmable LED lights, and more. InfineaIQ, IPC's cloud-based management console, provides remote monitoring and management capabilities for IPC peripherals. InfineaIQ can be used to monitor inventory settings such as firmware versions, scanner configuration / modes, and payment settings. IQ can also be used to remotely update these configurations over-the-air. 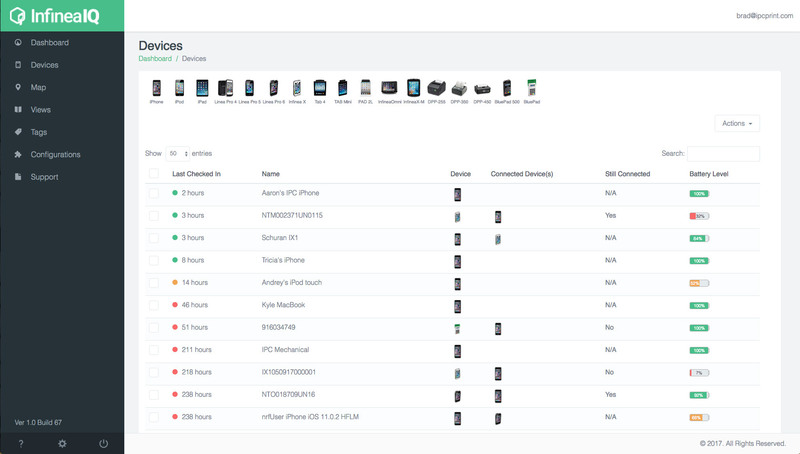 A first of it's kind, the InfineaIQ Jamf Pro Integration provides a fully automated, dynamic inventory reporting solution for iOS devices and their associated IPC peripherals. IT administrators can benefit from a holistic view into the health of their install base within Jamf Pro, easily identify problems with the device or it’s peripheral, and proactively take action to keep users productive. Simply deploy the InfineaIQ app via Jamf Pro to a device that is housed within an IPC case to automatically link the two assets. 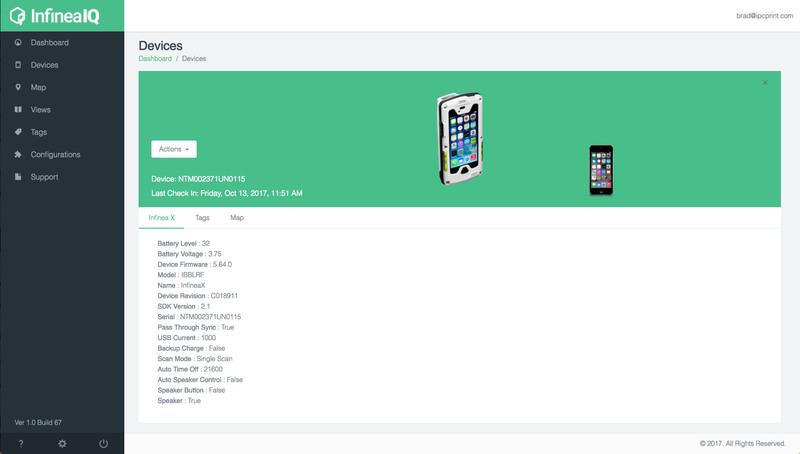 The collective inventory information is then displayed in the respective iOS device's record in Jamf Pro. Associating iOS devices and their peripherals can be a painstakingly manual process. This often includes time consuming tasks such as kitting, asset tagging and manual data entry into a spreadsheet or third party inventory system. If devices are mis-paired prior to being deployed, even greater challenges can emerge. 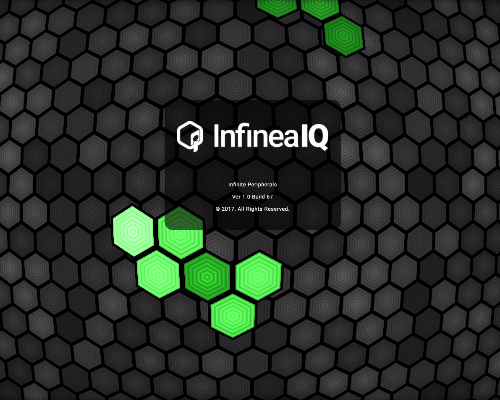 With InfineaIQ and Jamf Pro, IT administrators can automate the process and avoid these headaches completely. With the power of Jamf Pro, IT administrators can prevent potential issues and service needs before they affect users. For example, Smart Groups can be created to dynamically collect devices based on criteria about the peripheral device (e.g. firmware level, battery health). If a device meets the selected criteria, Jamf Pro can automatically notify the IT admin to push out a remote fix from InfineaIQ or alternatively notify the user to surrender the device to IT for investigation. 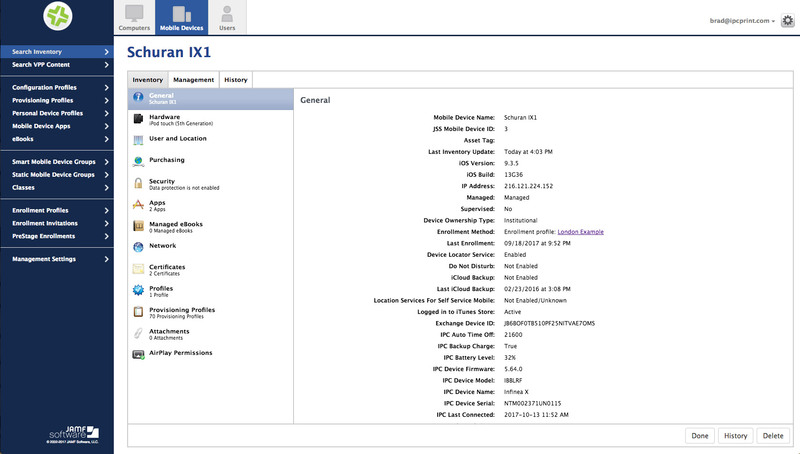 If an issue is detected that requires hands-on service from IT, Jamf Pro’s ServiceNow Integration can automate the incident creation process, passing along all pertinent inventory data about the iOS device and the IPC peripheral. 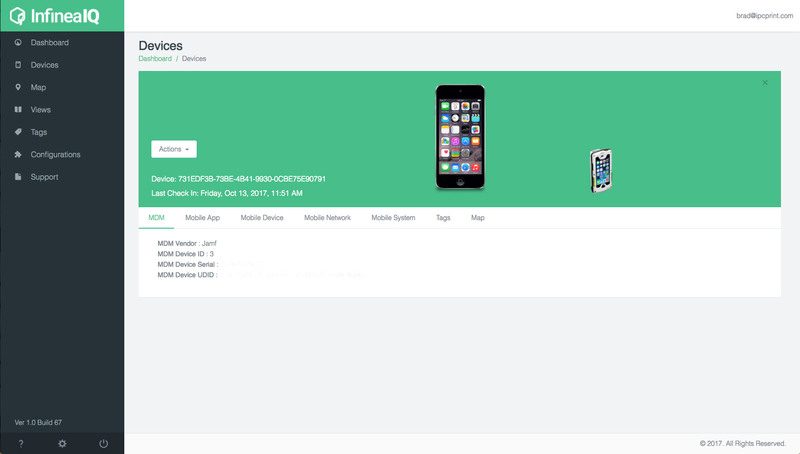 In the interest of user-transparency, the device’s wallpaper can be updated to reflect that a IT ticket has been automatically created, and that a replacement device will be issued. If either the iOS device or peripheral are replaced independently, the inventory records will update automatically in Jamf Pro prior to redeployment to the user.